Simple, because iClone5 has been built from the ground up as an essential tool for quick animation production. There is no other application in the industry that can deliver the speed, customization, flexibility and versatility of iClone5. iClone5's powerful engine allows for real-time animation, and motion capturing, which sets it apart from other 3D software as you can literally watch your animations while you create them. 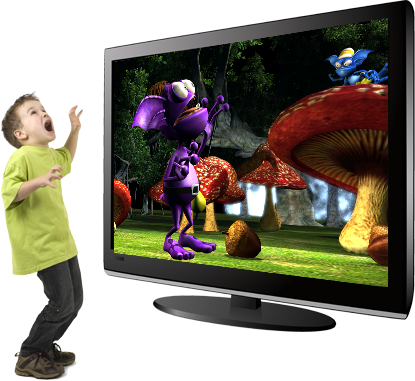 Now the possibilities are mind-boggling with this all-in-one animation studio! iClone is everything a single person needs to produce multi-role, quality projects in a fraction of the time. Its superior preset layouts are ideal for directing, storytelling and visualization. iClone helps novice users skip the hassle of 3D modeling, character rigging, and key frame animation; and replaces it with fast, templated-based content. iClone 3DXchange provides the best, and most flexible, working pipeline for multiple project outputs with 3D tools like SketchUp, 3DS Max, Blender, Maya, Poser, ZBrush and others. iClone covers all your animation needs with embedded content and expandible libraries. With straightforward coversion tools, now you can easily bring in motion data and content from other external applications. Due to Globalization, anything associated with animation now brings much attention and potential for sponsors and revenue. Create powerful visuals within a completely controllable environment without having to actually build a set. iClone enables TV and Online shows to deliver project deadlines and quality. iClone is the first in-house mocap studio that allows you to directly bring in motion data without the burden of complex motion pipelines or tedious conversion issues via Mocap Plug-in. It offers the most affordable, and intuitive, motion capturing solution in the industry! You no longer need annoying motion capture suits or expensive cameras. 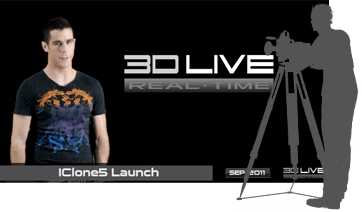 Just launch iClone5 with any off-the-shelf depth camera, and start animating. iClone's production layout is logically designed with Stage, Set, Actor, Animation, Media and Export features that make it easy for anyone to understand. Users can be their own directors and start animating without any hassles of creating content from scratch. Its effortless drag & drop interface lets you focus on your storytelling by freeing you from tedious proceedures. The embedded content contains tons of character bases with customizable facial & body templates along with outfits, props, motion profiles, particles and post effect templates that allow you to start animating on the spot. iClone is not only an application, but also an entire community. Reallusion hosts the largest, real-time animation marketplace of its kind that allows you to exchange and sell content with other iClone designers around the world. With an easy import pipeline, users can now search and download millions of free assets from Google's 3D Warehouse and use them inside iClone, royalty free! iCloners may create their own designs and sell them in an open community which promotes discussion, exchange and collaboration with friendly contributors from all around the globe. iClone meets the needs of today's educators by developing professionals with well-rounded talents for many industries.